He will be presented with the award at the AACR Annual Meeting 2017 during the opening ceremony on Sunday, April 2, at 8:15 a.m. ET in Hall D-E of the Walter E. Washington Convention Center in Washington, D.C. 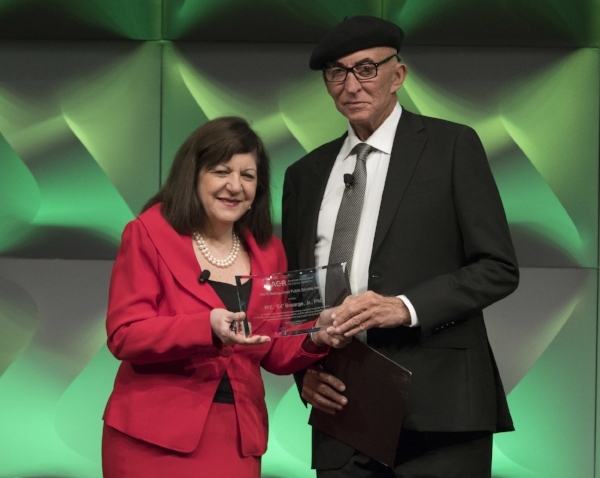 The Distinguished Public Service Award honors the extraordinary contributions of an individual or group whose groundbreaking, innovative work exemplifies the AACR’s mission to accelerate the prevention and cure of all cancers through research, education, communication, and collaboration. Distinguished public service takes many forms, and past winners have included generous philanthropists, government officials, advocates, and members of the media. Bosarge embodies the substance and spirit of this award. “It’s particularly gratifying for me to receive this award. Dr. Hong and I share the same commitment to and passion for the amazing possibilities inherent in regenerative medicine and immunotherapy, as well as the importance of supporting and mentoring young scientists,” said Bosarge. A passionate believer in the power of preventative and regenerative medicine to not only treat disease but also to promote a longer, healthier life, Bosarge has launched and supported a wide variety of research and development efforts. In recent years he founded Black Beret Life Sciences LLC to invest in game-changing biotechnology innovations. Since its inception, Black Beret Life Sciences has funded research for treatments based on regenerative medicine for cancer, diabetes, neurodegeneration, osteoarthritis, and other conditions related to aging. Bosarge’s work in the field has been recognized by the Vatican’s Pontifical Council for Culture, which honored his “unwavering devotion to supporting regenerative medicine and cancer research” with the Key Guardian Award and Key Philanthropy Award during the first and second International Regenerative Medicine Conferences in 2011 and 2013. In addition to the tremendous strides made in the field of medicine, Dr. Bosarge is recognized globally for his application of advanced mathematics to the fields of finance and energy, where he has likewise developed innovative yet practical solutions to an exceptionally varied array of scientific and financial problems. Bosarge and the Bosarge Family Foundation support myriad charities and organizations dedicated to life sciences and health, education and public policy, and renewable energy and environmental science. These include MD Anderson Cancer Center, Texas Children’s Hospital, Stem for Life Foundation, Houston Museum of Natural Science, George W. Bush Foundation, the Bosarge Family Aquatic Center at Boothbay Region YMCA in Maine, as well as the Coastal Maine Botanical Gardens and the LEED Platinum-certified Bosarge Family Education Center, known as Maine’s “greenest building.” Bosarge is a member of the MD Anderson Cancer Center board of visitors.